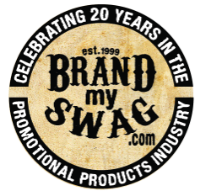 First and foremost we here at BrandMySwag.Com want to tell you how much we appreciate your business. Because we love doing business with you we want to be sure they you, our valued customer know exactly what we can do regarding Returns and Exchanges. You may cancel your order within 24 hours but why would you want to miss out on some GREAT SWAG? If you need to return an item for a different size please contact us for a return approval number. These are custom items, There is only one allowed reason which is to exchange a non personalized item for a different size Please refer to Exchanges. If you are not absolutely sure you want this SWAG...do not order it from us!. We will possibly exchange it or remake it but we will issue NO CASH REFUNDS or REFUNDS on Credit. A: Each item is ordered within 3 days of the time you place your order. If it is a common item that we print all the time, production time takes 1 day. So if everything goes perfectly and you are within a 2 day ship you should receive your items within 10 business days, (Mon-Friday) You could get a delivery on Saturday because we use USPS. We do not work on Sat or Sunday! If all goes wrong as it sometimes will we will claim up to 15 business days,. Q: If I live in or close to Clarksville, TN can I pick up my S.W.A.G in the shop. A: Yes, please check "store pickup option" and we will call you as soon as your S.W.A.G. is ready. A: YES YOU CAN...we often do larger orders and have them shipped to one address, say overseas! Yes we do that too! This is so cool! We can ship to virtually any address in the World, however, there are a few things we need you to know. Unfortunately, there are restrictions on some products, and some products cannot be shipped to international destinations. When you place an order, we will estimate shipping and delivery dates for you based on the availability of your items and the shipping options of your choice. Delivery Time: From the time of order-to shipping day, our process for orders in the United States usually takes about 10-12 business days from Monday to Friday. Shipping by Weight; Shipping rates for many items we sell are weight-based; Weight information is usually found on the item detail page that reflects the policies of the shipping companies we use, and all weight will be rounded up to the next full pound.